By getting the best cheese grater for your kitchen needs, you will make the task of grating cheese so much easier and faster. There are also models that keep your hands far away from the blades, thereby making the method safer as well. There are 2 major types of cheese graters – electric and non-electric. For the non-electric models, there are 3 major types of units – a boxed type, a rotary type, and a folding unit. Each one is explained briefly below. Electric cheese graters are powered by electricity, so they come with cords that are plugged into an electrical outlet. There are also models that have rechargeable batteries. An electric cheese shredder will surely make your life in the kitchen easier, especially if you’re a cheese lover. Rotary cheese graters are designed to work with an electric model. They’re fast and effective – all the user has to do is rotate the handle to make it work. Box cheese graters are shaped like a box with 4 sides – and each side has slicing blades for shredding and cutting cheese. Typically, 1 side produces fine grates of cheese and another side makes medium grated cheese, and yet another side makes coarsely grated cheese. The 4th side usually serves as a cheese s﻿﻿lice﻿﻿r. Folding cheese graters work like boxed graters. However, they come with limited surfaces because of their design. This model usually comes with 2 grating sides or surfaces, which can make fine and coarse grated cheese. Cheese graters usually come with a set of blades for different purposes. 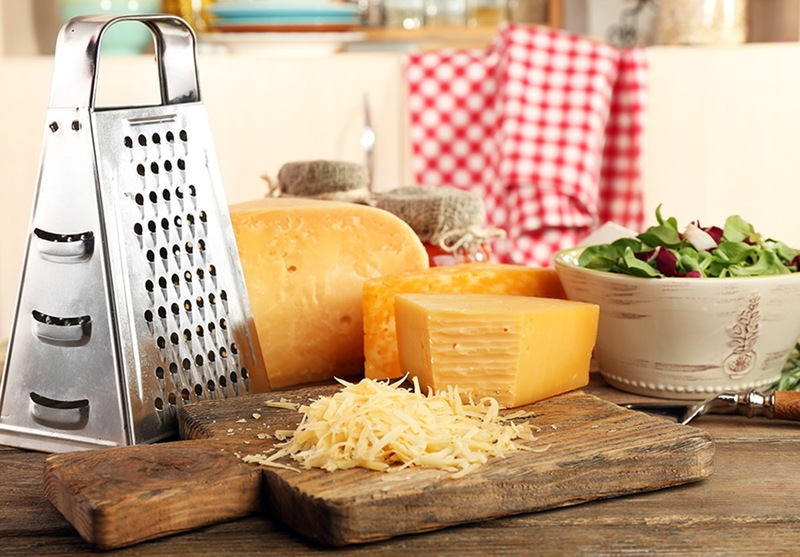 For hard cheeses like parmesan, the best grating surfaces would be the fine and medium sides (hard cheeses are not that difficult to grate anyway, as long as the blades are sharp). 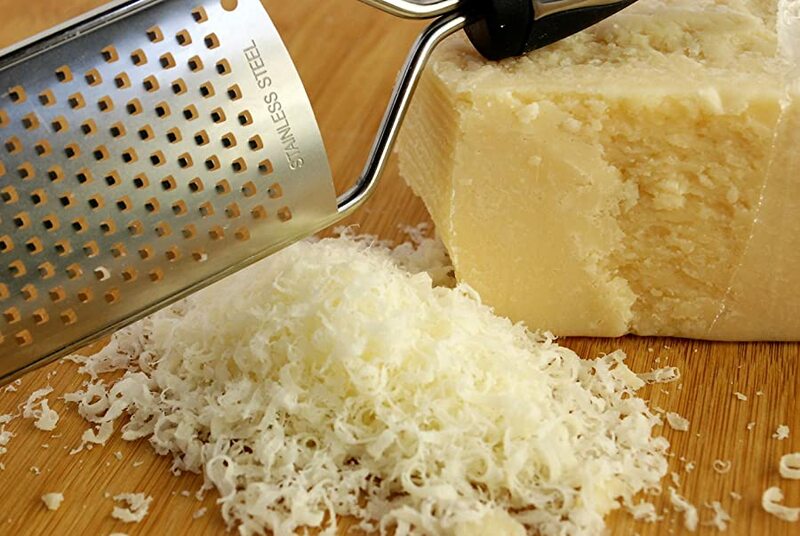 A parmesan cheese grater can also handle other types of cheese (and other types of food, for that matter). Soft cheeses are easier to grate with the coarsest blade setting available. To further ease up the process, you can put the cheese in the freezer for a few minutes to hard it up. The cheese will then be easier to shred or grate without getting mushy. Note that cheese graters are meant to handle the task of grating and shredding cheese. However, they are actually multipurpose kitchen accessories that can also grate, shred and slice fruits, vegetables, nuts, chocolates, etc. Consider the following points below before purchasing a cheese grater. Electric or Non-electric – First of all, make up your mind on whether to get an electric or non-electric model. You can decide to spend more on an automatic cheese grater (electric) which is easier to operate and is useful for slicing, grating and shredding other food ingredients. Your Choices in Manual Models – Know your strength when deciding to purchase a manual unit. Rotary cheese graters are easy to use, but still, require some degree of strength from the operator. 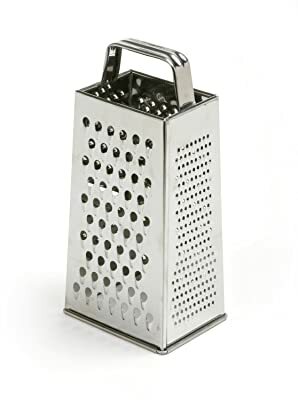 Cheese graters with bladed sides like box graters are inexpensive, but they also require strength (they are also riskier to use because the blades are exposed). Operation – Choose a cheese grater that you can easily handle. With an electric model, you only need to point and shoot the device to a container or bowl. 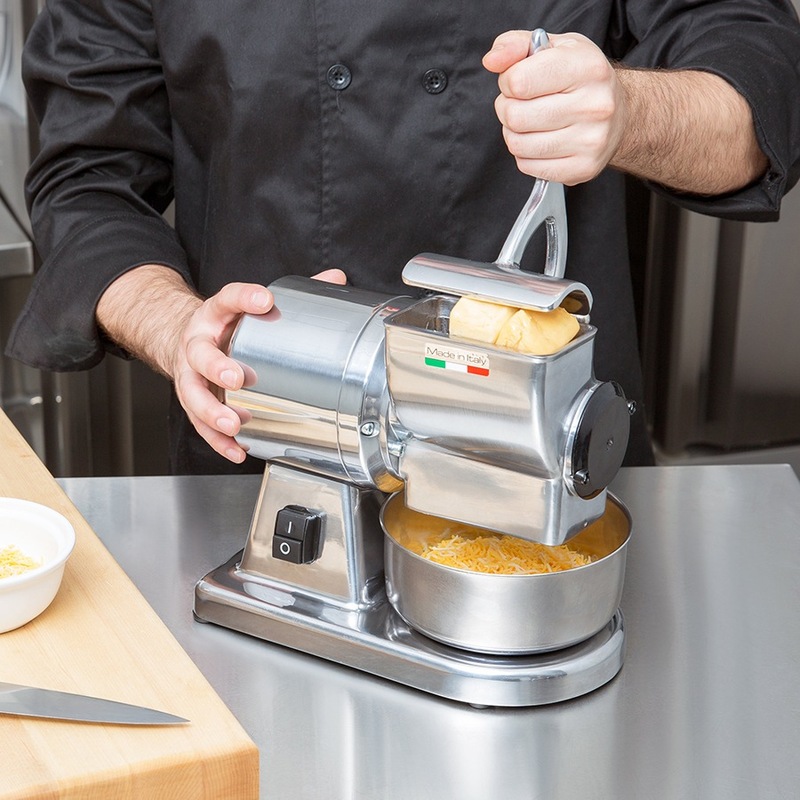 With a rotary grater, your role would be to turn the crank or handle. And with a box grater type, you need to slide the cheese downward to slice, grate or shred it. Note that a hand cheese grater may be inexpensive, but it’s a little harder to use than an electric model. Materials – As with other kitchen devices, get a model that’s durable and long lasting. Really, don’t waste your money on something that’s cheap and flimsy. In this case, a stainless steel cheese grater (or a model with stainless steel blades) makes for the best choice. Price – I have good news for you – cheese graters are very affordable (whether electric or non-electric). Since this will be a very useful kitchen device (as you can also use it for other types of food), I would suggest getting the best unit that you can afford. 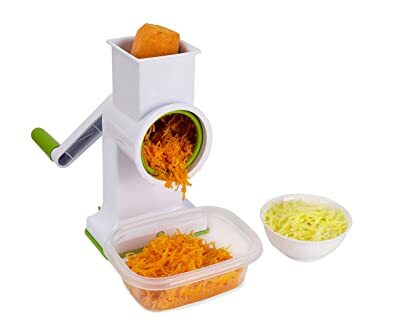 This is an electric model of a cheese shredder machine and it comes with a cord. You can get the Presto 02970 SaladShooter in white color. Design – This model can slice, shred, and grate cheese as well as fruits and vegetables. 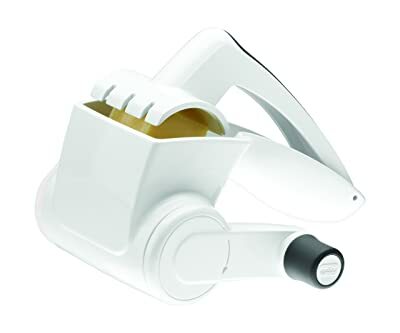 Included Parts – It comes with 4 interchangeable attachments – for regular cuts, thick slices, rippled cuts, and shredded cheese. Vacuum Force – While cutting and slicing, the gravitational force will automatically pull down the food into the cutting chamber. There’s no need to manually push the ingredients down the chute. Cleaning Procedure – The base of the unit can be wiped with damp cloth. All other parts are dishwasher safe. It cuts, slices, and shreds fast (a lot in a minute). Having adjustable thickness makes it suitable for making different types of recipes. The cones can be easily interchanged. Some food items (like carrots) can leave stains (permanently). 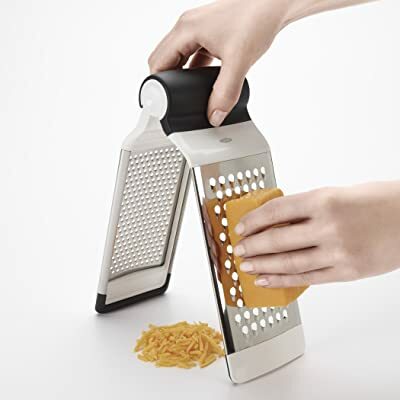 What I really like about this cheese grater is that it can make thick and thin cuts of food. You can even create fancy slices with it. And it’s not just for cheese – it can be used for fruits and vegetables as well. It’s easy and comfortable to use. This non-electric rotary cheese grater works a lot like an electric model. 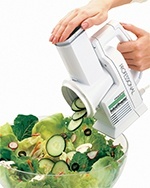 It operates by manually turning the handle – but the results are quick and well cut. This is actually a commercial grade model as it can be used in restaurants. It’s also affordable enough for home use. Materials – It’s mainly made of stainless steel, including the handle. 4-Sided Design – There are 3 sides for grating fine, medium, and coarse cheese. The 4th side is meant for slicing. Construction – Everything is made of metal, there are no rubber grips for the handle or rubber support for the base. Cleaning Procedure – Hand wash the unit with mild soap and water. 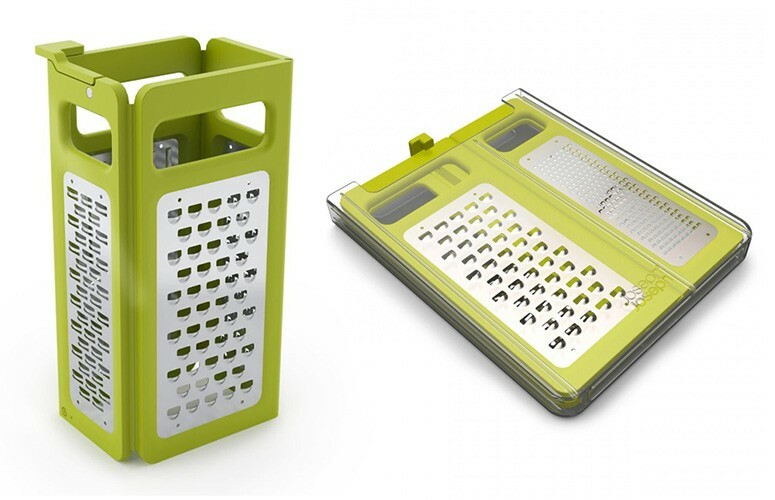 As a folding cheese grater, the OXO Good Grips is available in stainless steel color. Materials – It comes with stainless steel blades. 2 Grating Surfaces – The coarse grating surface is ideal for semi-soft ingredients like cheeses, apples, and cabbages. The medium grating surface, on the other hand, is ideal for hard ingredients like hard varieties of cheese (e.g. parmesan), carrots, potatoes, etc. MultiPurpose Design – The 2 surfaces can be locked together or used separately. Grips and Nonslip Feet – The unit is stable while being handled. Cleaning Procedure – The unit can be separated in 2 during cleaning. They’re dishwasher safe and can also be washed by hand. It’s stable to use as a pair or as individual pieces. This is a versatile cheese grater as you can use it over a container or a cutting board. It works a lot like a box grater, but it only has 2 sides. It can also be used flat or in slanting position. Materials – The blades are stainless steel, and the handle is plastic with the rubbery feel. Operation – Place the nonskid base on top of a dish or container to catch grated cheese (and other food) during use. Design – Its blades are designed to be very sharp (for fast cutting) and its size is designed to be big. Cleaning Procedure – To avoid rusting and corrosion, it’s advisable to wash it immediately after use. Allow it to air dry before storing it. The unit is easy to clean. The grater is solid and stable during use. The rubberized base can sometimes trap food inside. This is a nice all-around grater for cheese, nuts, fruits, vegetables, chocolates, etc.. Perhaps its only design flaw is that food particles can sometimes get trapped on the unit’s base. The Kuuk Drum Grater is a manual, hand powered rotary grater. You can get it in white color. Operation – Just rotate the hand crank and the sharp blades will grate cheese (or whatever’s put into the chute). Package – It comes with 2 drums for 2 sizes of grated cheese (fine and coarse). Design – The suction base provides stability during use. Materials – The rotating blades are made of stainless steel and the rest of the unit is made of BPA-free plastic. Cleaning Procedure – Wash it by hand using mild detergent and warm water. 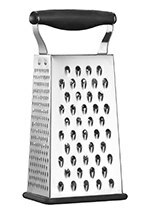 It grates fast (it takes seconds to grate a large amount of cheese). This is a fast and effective manual rotary cheese grater. Its the only flaw is that the suction base is not that strong. The Westmark cheese cutter is another model of a manual rotary grater. It’s available in black color. Materials – The blades and discs are made of stainless steel materials. Design – 3 feet with rubber sections keep the unit stable while using it. Folding Design – The legs can be folded to save space during storage. Cutting System – It can produce fine and coarse shreds of cheese. You can also use it to slice other types of food. Cleaning Procedure – You can wash it by hands using warm soapy water. The operation is fast (a lot can be produced in one turn). While the unit is small when folded, it takes up some space during operation. 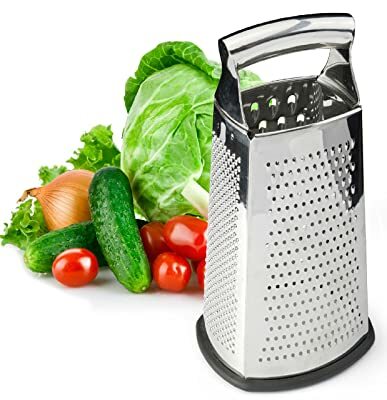 This versatile cheese grater can be used on fruits and vegetables as well. It’s a manual model that can produce grated cheese almost as fast as an electric unit. Materials – The drum blades are made of stainless steel. Housing – The main body is made of hard plastic. Design – The handle is ergonomically designed to be comfortable while turning the crank. Operation – Insert the drum, put in the cheese, hold the handle down to press on the cheese while turning the handle. Cleaning Procedure – All the removable parts are dishwasher safe. While this cheese shredder can only grate in one size, it’s the standard size for grating food in recipes. You can grate cheese, chocolate, nuts, fruits and vegetables with it. This model of OXO Good Grips is a box grater model. It’s available in stainless steel color. Materials – The blades are made of stainless steel and the main unit is made of BPA-free plastic. Design – There are 4 surfaces on the 4-sided box. The 3 sides carry the fine, medium and coarse blades. The 4th side is for slicing food. Construction – It’s made to be slim for ease of storage. 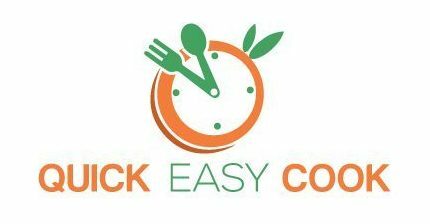 Attachable Container – a container (included) can be attached at the bottom of the grater to catch shredded food. It also works as a measuring cup (1 cup capacity) and the accompanying lid serves as the cover for your grated food. Cleaning Procedure – The removable parts are dishwasher safe. The handle has silicone lining for comfortable use. You can use the grater with or without the accompanying container. It’s a little hard to use with the container under as the unit will appear to be too tall for an averaged-height person. This is a useful model of the box grater. 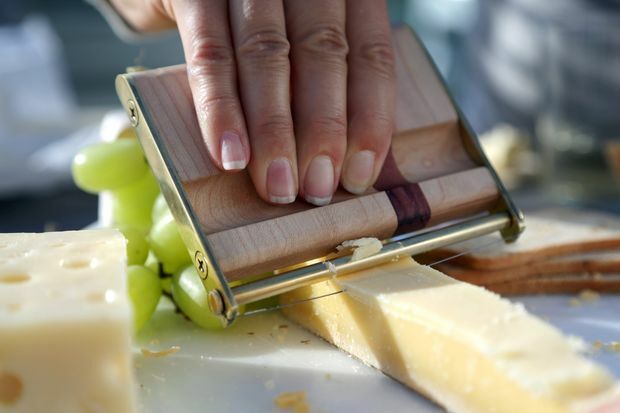 As with other box graters, always make sure that your hands are away from the blades when grating cheese. Materials – The main unit is made of stainless steel. Construction – The nonslip base securely positions the grater for optimum use. 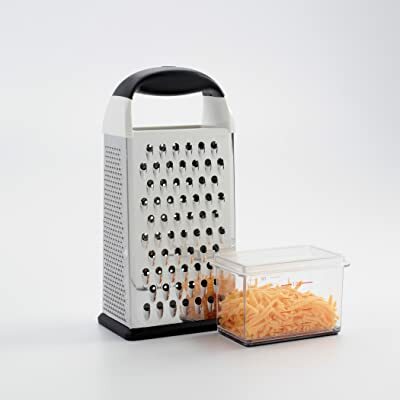 4-in-1 Design – The 3 sides of the grater can produce fine, medium and coarse shreds of cheese. There’s also a side for slicing food. Handle Design – It comes with a wide handle that’s also made of stainless steel. Cleaning Procedure – The unit is dishwasher safe. The construction is sturdy and stable. It’s easy to manage and control during use. The rubber base can be removed for proper cleaning. In spite of being the last product in this Top 10 list, this is an effective grater for cheese, nuts, chocolates, fruits and vegetables. It also works great for zesting lemons. So, there you have it – a list of 10 cheese graters to choose from. Get the unit that’s most suitable to your needs and you will surely be happy with your purchase. This list only contains one electric cheese grater model, and I highly recommend it – the Presto 02970 Professional SaladShooter Electric Slicer/Shredder (it’s the best electric cheese grater I found so far). It will make the task of shredding cheese so much easier and faster. And it’s a versatile kitchen appliance that you can use for slicing and cut other ingredients for cooking (I really think it’s the best cheese slicer/ grater on the list). 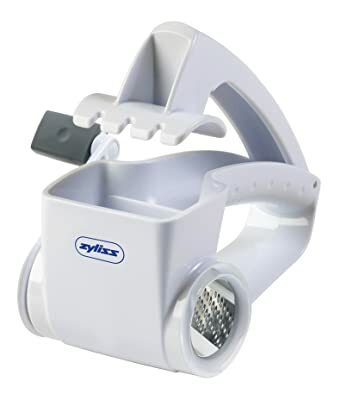 I also like the rotary cheese graters in the Top 10, but there’s one I like the best – the ZYLISS Classic Rotary Cheese Grater - NSF Restaurant Certified. This may be a hand-powered (manual) device, but it almost performs like an electric model (therefore, it’s fast and effective as a cheese shredder). For me, it’s the best rotary cheese grater in the list since it’s oriented to be used by right and left-handed people. For a really simple box grater, the Norpro 339 Stainless Steel Grater would be a good choice. It’s easy to use, durable, and cheap (the cheapest of all the models in the Top 10 list). 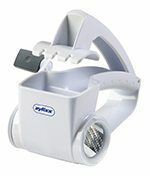 If you’re on a budget, this could be the best cheese shredder/ grater for you. I am also recommending the OXO Good Grips Two-Fold Grater. If you only need 2 sizes of grated cheese, this will work for you. Its folding design also makes it easy to store. I am confident that you will make the right decision in choosing the best cheese grater for your needs. And I am actually curious about it – so please let me know by leaving a message in the comment section below. Don’t forget to share this post, too, so that other people will benefit from it as well.